Each midi controller uses specific velocity values in order to display a specific colour on LED enabled inputs such as Pads. In order for you to quickly and easily get the right feedback for your controller, we’re beginning to build a comprehensive list for different controllers here. Leave comments below to add &amp; request values for controllers not listed. LED feedback options are available for all button mapping types. In most cases you can add a custom 'on' and 'off' colour to it. You may find that some mapping types, have more/different options. (A/B Track assign has 3 options, 1. when track is assigned to A, 2. when track is assigned to B, 3. when track is not assigned to any). Also, session boxes have their own set of LED options for when clips are in a variety of different states. You mention that leaving the value blank will use the default. I assumed you meant that it would remain the colour it was before, but I think I may be missunderstanding as my APC mini buttons all go green if I leave the value blank. Any idea for an APC mini. By "use the default" I mean that the midi controller will revert to the colour it would usually display if nothing had been set at all. I'll see if I can find some values for the APC mini and post them up here. I'll add these to the list! Thanks for your answer from the 04/22/17. Sorry I`ve not got back to you sooner. Thanks for answering both my questions and I`m hoping I find time to explore this further on the weekend. I think the midimix buttons only have one colour. Maybe "127" for on and "0" for off? Will these values override the LED's on the midi fighter twister and if so do you have a list of the colours like the above? Yes they should override the colours on the twister. I don't have a list for it but if you open the midi fighter utility, I'm pretty sure it gives you the velocity values of each colour in there. LEDs working fine right now so far, but is it normal for them to not work when assigned to MIDI CH2 ? The midi channel needs to be the same as the button you are trying to "light up". So if the button is on channel 1 then it will not work on channel 2.
somehow they do no light up, although buttons are all on the assigned MIDI channel (got that problem with Mute/Arm Rec/ Solo function). Sorry about the delay in my reply, I must have missed your comment. In preferences > link/midi tab, have you turned "track" and "remote" on for both the input and out of your script/controller? This should be helpful for the Novation Launchpad Pro and also the Launchpad MK2, which has the same colour table. For the tKontrol F1 the buttons need to be set on "HSB". Can we enter HSB values in Remotify? How many of you ladies&amp;gentlemen own and use the Xone:K2? How many are interested in sharing technical know-how about generating a script for the K2? Unfortunately the K2 has a very peculiar MIDI implementation. Regarding this thread topic, for example, it *DOESN'T* send/receive LED colours using note velocity values. 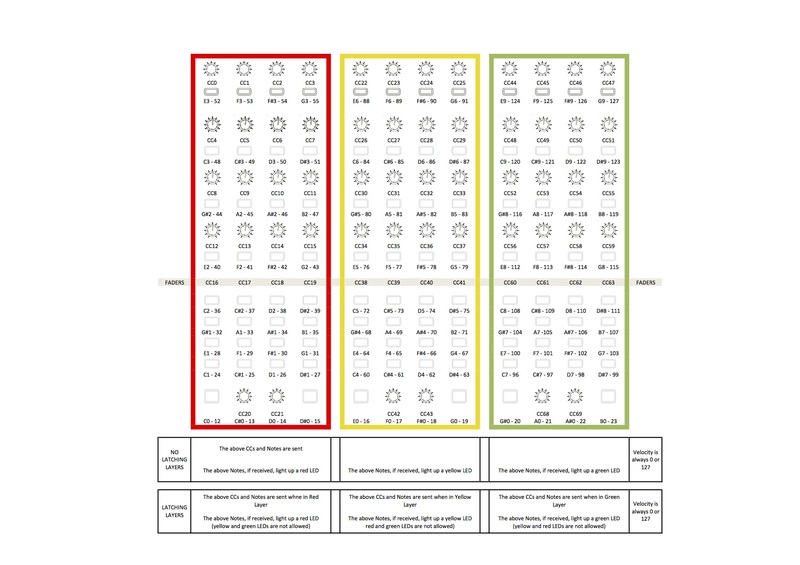 It uses different notes-values-sets for each one of the three allowed colours (red, yellow and green). Using two K2s together is very tricky as well, to say the least, especially if you want to use them on a single USB port . I easily managed to generate a very nice script using REMOTIFY. But I am still *NOT* able to find a simple way to change a LED color dynamically using REMOTIFY. Of course I can write a companion MAX device and/or a BOME MIDI Translator Pro set of rules, but I do not want to. So far, for example, my clip button matrix has simply LED-OFF for a playing clip and LED-RED for a stopped clip. Again, I am still not able to manage a dynamic change of colour in such a MIDI implementation. Coming back to where I started, if anybody wants to share know-how... I would be more that happy! Here are some of the midi specs for the Akai APC mini.. Here is a summary of my understanding of the Allen&amp;Heath K2 MIDI implementation. I just got an APC40 MKII and would love the color codes for it. I'm also wondering if it's possible to set up the LEDs to reflect the clip or scene color in Ableton. That way I can keep track of my clips and scenes as I scroll through the session box. It's a feature that works in the Akai script, but I'm not sure how I could do it through Remotify or combine aspects of both. 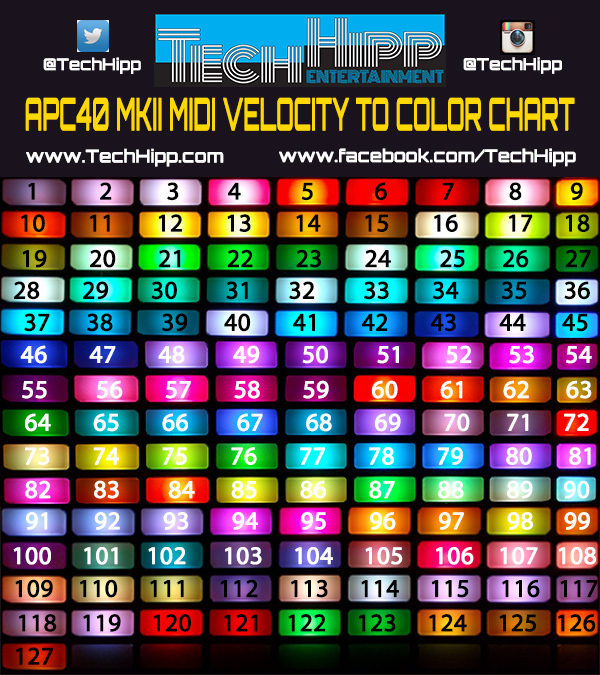 Do a Google search like this: "akai apc40mkII midi implementation" to get the color codes info. Working RGB button to velocity color map for the APC40 MK2. Hello. Is there a way to keep the pads color based on the actual color of the clip assigned to it in ableton? I´m using the Xone K1 and i´m also looking for a way to get the LED color feedback i want. As i know the shift buttons use identifier+4 for amber and +8 for green, all other buttons are using +36 and +72 of the original Note number. Maybe its possible to manage that with midisend, like the NI Maschines scripts do for the HSB color buttons (they send values on 3 Midichannels). I can not get LEDs to work on my Launch Control. Buttons work as they should but the LED do not light up... (I did use numbers from John's first post). First post here. Just a small heads up that following values will work for all Livid controllers that have RGB support and not just OHM. These are universal. Anyone knows if this is possible with komplete kontrol mk2? What do you mean exactly with the Komplete Kontrol MK2? There are no Buttons with colored LED feedback. Just the Keyboard and as i know, you can use the komplete software (and Maschine) as a vst instrument in Live with full function + controls for Live anyways. I don´t see any need for customizing a Midikeyboard.